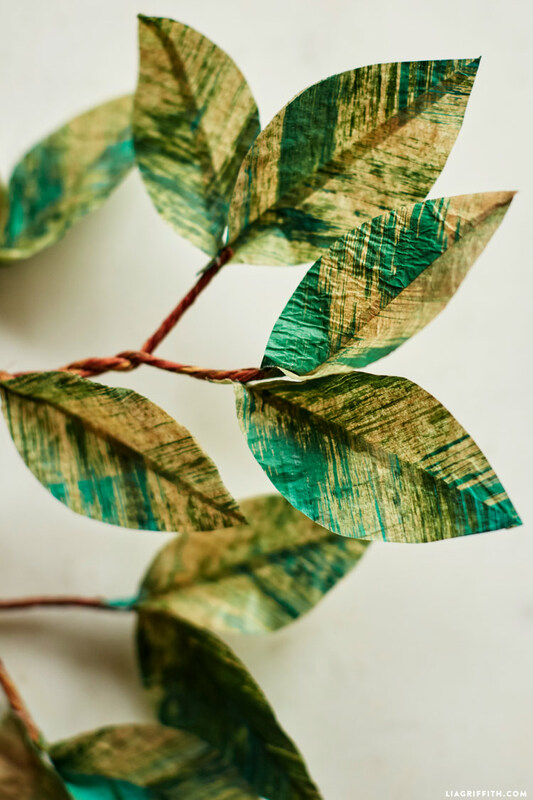 Spring is upon us and we are getting giddy thinking about all the new paper flower and botanical projects we can create with seasonal inspiration. Even before the flowers start blooming, one of the first signs of spring is the vibrant greenery popping up all around us. 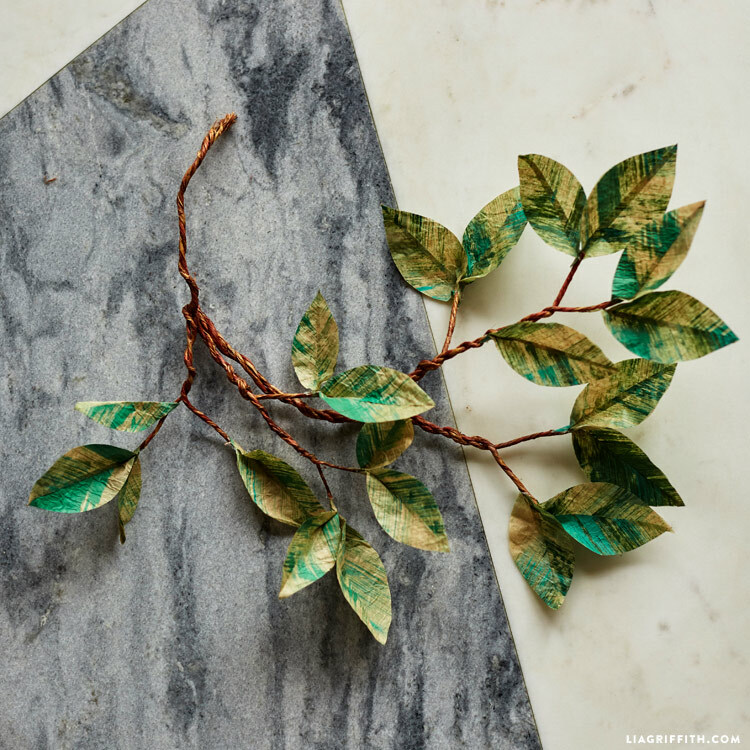 To capture some of that awakened energy, our designer Jessica made this gorgeous branch with just some simple tissue paper leaves. 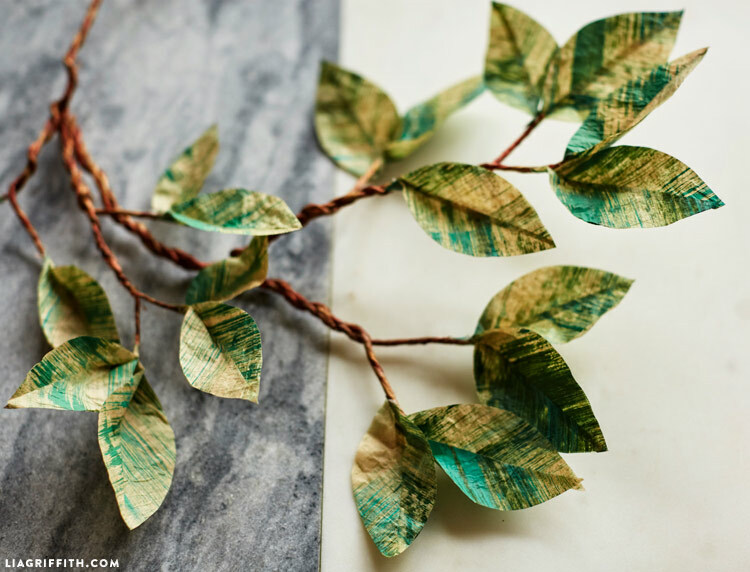 The real trick for creating beautifully unique tissue leaves is paint your paper with soft brushstrokes of multiple shades of green. The variety in color creates visual interest and depth, plus this project is a great opportunity to play around with different painting techniques! Cover your work area and lay out a flat piece of tissue paper. Dip chip brush in a small amount of slightly diluted paint. Brush paint in steady vertical strokes across the surface of the paper. Repeat with the second paint color. Experiment with quantities of paint until you get the right amount for you. When dry, fold tissue in half and glue together with slightly diluted Mod Podge. Let the glue dry and then cut 2-inch strips of paper with the brushstrokes aligned at an angle. Print the PDF template below and use it as a guide for cutting your leaf pieces. 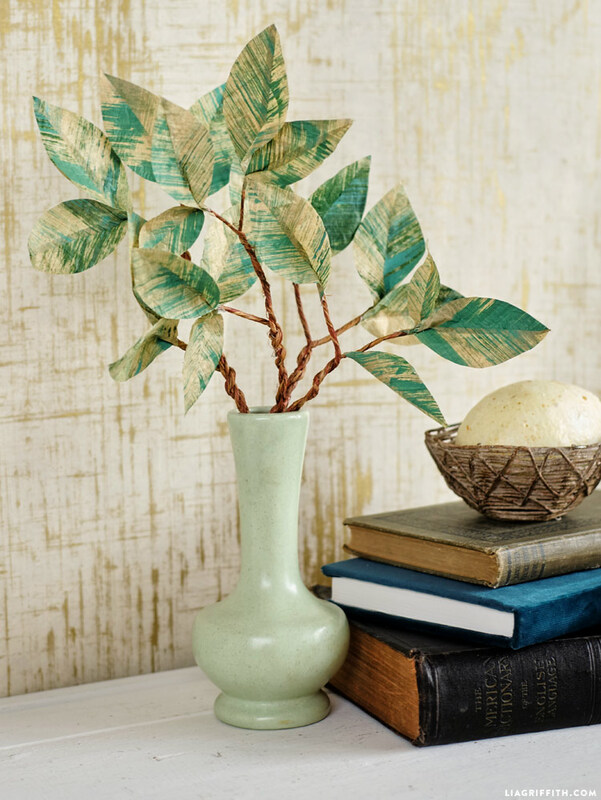 Paint Mod Podge along the straight edge on one leaf half, slightly overlap the second leaf half and press together. Trim the tip of the leaf. There will be 5 small leaves and 5 large, but you can easily cut more to make a fuller branch. Cut and twist the wire to create your branch form. Pinch and hot glue the bottom ends of the smaller leaves to create little stems. Glue the smaller leaves to the sides of the larger leaves. Adjust your finished branch shape and add additional leaves if desired. Painting the tissue paper can get a bit messy, so you will want to cover your work space before you begin. 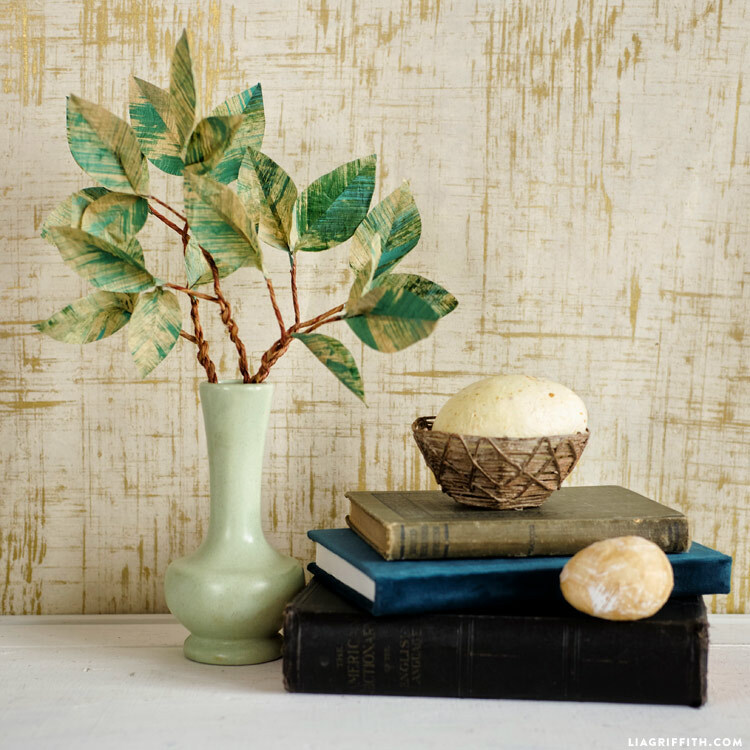 You can easily do so with butcher paper or newspaper, or you can invest in a drop cloth from your local hardware store if you will be painting more in the future. We picked out two shades of blue-green paints, but you can also use more for variety. Before using the template, we decided to cut the paper into strips so that we could really get the brushstrokes positioned to look like veins. We experimented with this tissue painting technique for a series of projects, so check out our decoupage eggs and tissue paper feathers for more examples. In fact, we made all three of these projects to arrange together in a gorgeous mantel display! Any acrylic paints from a craft store would work, but we used 2 different brands that we had readily available in the studio. One of the colors was “Aqua” from Blick, which would look great with any dark evergreen color!